An Assistant Wrestling Coach under the supervision of the wrestling coach assists the athletes and takes charge of all aspects relating to the wrestling program. 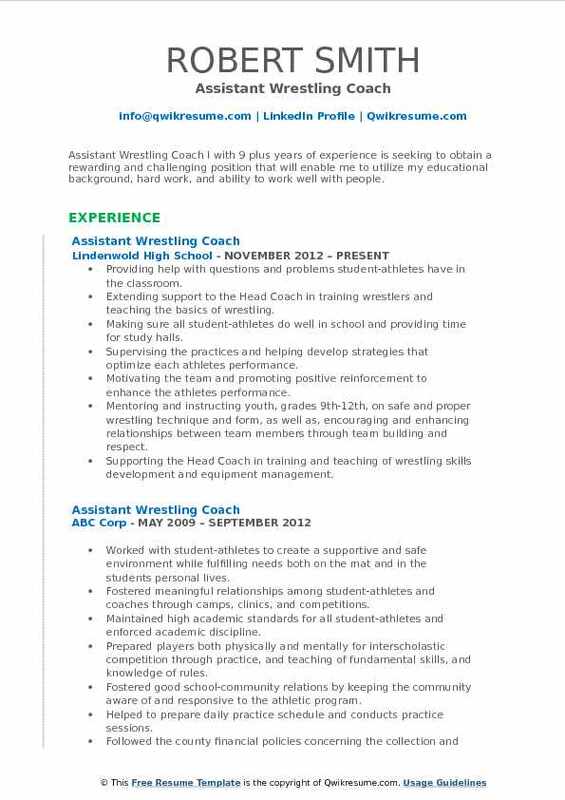 Some of the highlighting coaching roles and responsibilities that are assigned to these wrestling coach assistants are – to coach the athletes, develop the athletes gaming technique and teach them strategies to combat, train and give moral support, conduct training programs and handle the travel schedule of the wrestlers. They should also mentor the athletes, monitor the wrestler’s academic profile and report to the Wrestling coach. To become an Assistant wrestling coach, candidates are expected to be a good wrestler at the first place and have in-depth knowledge of the game and be powerful enough to interpret the moves of the opponent player. 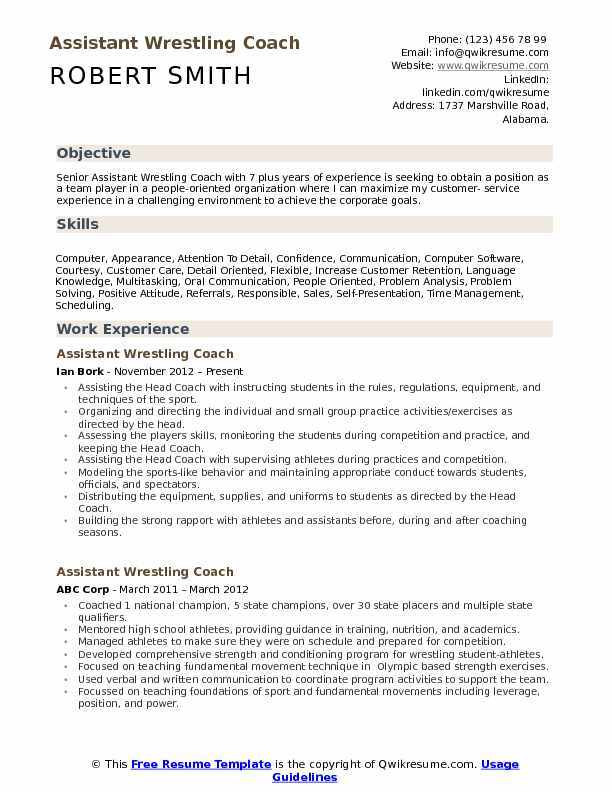 Assistant Wrestling Coach Resume normally portrays a degree with specialized athletic training. 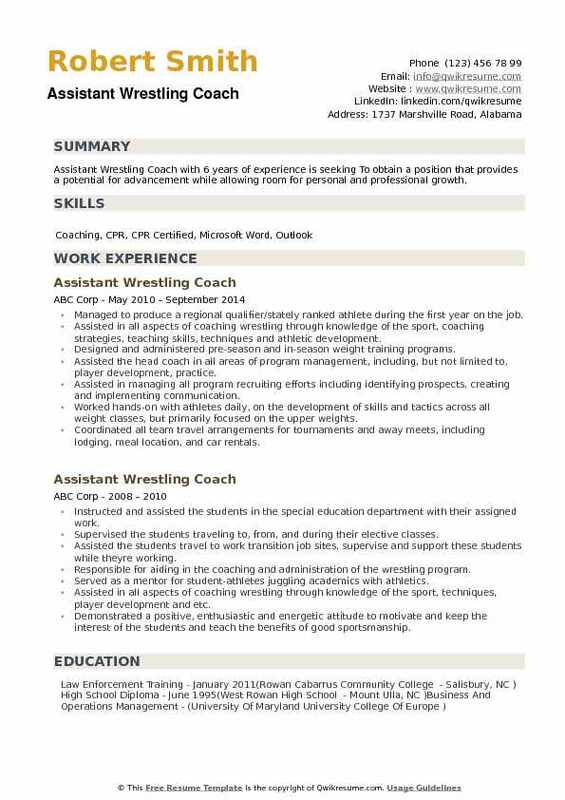 Summary : Senior Assistant Wrestling Coach with 7 plus years of experience is seeking to obtain a position as a team player in a people-oriented organization where I can maximize my customer- service experience in a challenging environment to achieve the corporate goals. Skills : Computer, Appearance, Attention To Detail, Confidence, Communication, Computer Software, Courtesy, Customer Care, Detail Oriented, Flexible, Increase Customer Retention, Language Knowledge, Multitasking, Oral Communication, People Oriented, Problem Analysis, Problem Solving, Positive Attitude, Referrals, Responsible, Sales, Self-Presentation, Time Management, Scheduling. Assisting the Head Coach with instructing students in the rules, regulations, equipment, and techniques of the sport. Organizing and directing the individual and small group practice activities/exercises as directed by the head. Assessing the player's skills, monitoring the students during competition and practice, and keeping the Head Coach. Assisting the Head Coach with supervising athletes during practices and competition. Modeling the sports-like behavior and maintaining appropriate conduct towards students, officials, and spectators. Distributing the equipment, supplies, and uniforms to students as directed by the Head Coach. Building the strong rapport with athletes and assistants before, during and after coaching seasons. Summary : Highly versatile and adaptive Assistant Wrestling Coach with 8 plus years of experience is seeking a challenging position for a progressive and dynamic company where I can grow as a professional in the business world. Responsible for the team's financial activities such as budgeting, fundraising, and coordinating cost-efficient team traveling. Conducted all the recruitment for high school talent to the west point by cold calling and regular home visits to introduce the wrestler and their family to the program. Developing collaborative relationships with staff and students of local colleges and universities including participation in job fairs and mock interviews. Facilitating the team practices and conducted targeted workouts to reach and maximize full potential. Maintaining strong communication with the university and student-athletes to ensure recruiting efforts are properly aligned with wrestling program needs. Under my recruitment, five west point wrestlers in 2015 and four in 2016 qualified for the NCAA championships. Assisted with the development of team strategy, analyzed the performance of the student-athletes. 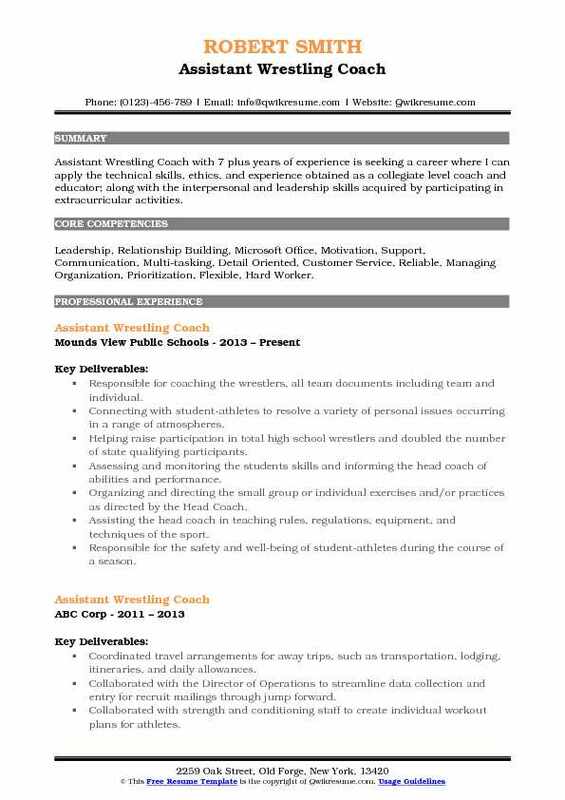 Objective : A hardworking and reliable Assistant Wrestling Coach with 2 plus years of experience is seeking a position that allows me to learn and expand on my current set of skills. Success in coaching individuals, as well as marketing programs to prospective clients. Strong ability to connect with colleagues and clients as well as working in a team atmosphere to reach common goals. Responsible for assisting the Head Coach with organizing the wrestling program at Centenary University. Assisting with conducting practices, motivating students, and instructing student-athletes in the match. Facilitate individual and small group practice activities/exercises as directed by the head coach. Performing and recording the support tasks such as distributing and maintaining eligibility forms. Marketing the program to prospective recruits and teams through emails, phone calls, social media. Assisting each student-athlete in achieving a high level of skills and sportsmanship. Setting and monitoring the practice schedules and determining special conditioning for athletes. Instilling effective nutrition practices in athletes to develop power and strength. Planning, implementing, monitoring, and assessing a wrestling curriculum program which assisted student-athletes in completing individual and team goals both in the short and long-term. 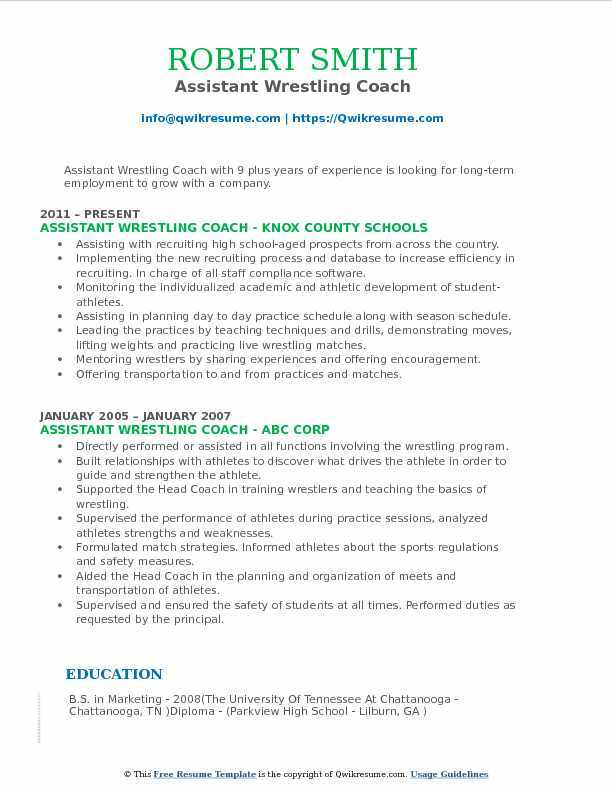 Summary : Assistant Wrestling Coach I with 9 plus years of experience is seeking to obtain a rewarding and challenging position that will enable me to utilize my educational background, hard work, and ability to work well with people. Providing help with questions and problems student-athletes have in the classroom. Extending support to the Head Coach in training wrestlers and teaching the basics of wrestling. Making sure all student-athletes do well in school and providing time for study halls. Supervising the practices and helping develop strategies that optimize each athletes performance. Motivating the team and promoting positive reinforcement to enhance the athlete's performance. Mentoring and instructing youth, grades 9th-12th, on safe and proper wrestling technique and form, as well as, encouraging and enhancing relationships between team members through team building and respect. Supporting the Head Coach in training and teaching of wrestling skills development and equipment management. Assisting in supervising practice and training sessions including post practices and matches. 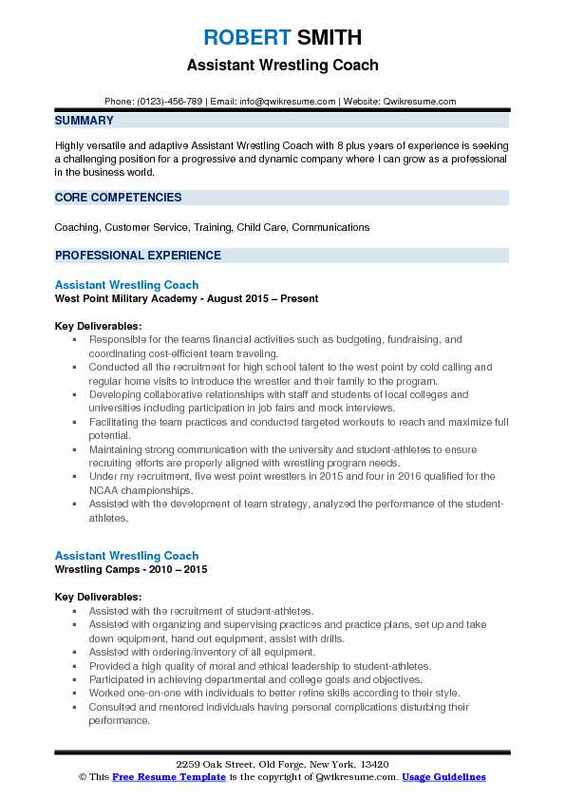 Objective : Assistant Wrestling Coach with 2 years of experience in Wrestling Coaching is seeking To obtain a position in Health and Fitness that will utilize my knowledge and work experience. Organized and directed the wrestling practices at the varsity and junior varsity levels. Modeled professional conduct towards staff, parents, student-athletes, officials, and opposing teams. Led and mentored the team academically, spiritually, and assisting them to grow as men. Maintained the team budget, ordering supplies, and kept a track of all information regarding the team. Served as a liaison between student-athletes, parents, coaches, and administrators. Coordinated and planned the practices and conditioning activities to maximize the student-athlete experience. Taught the student-athletes world-class wrestling skills including technique, conditioning, nutrition, academics, skills that can be carried over to everyday life. Maintained the positive relationships with athletes, parents, volunteers, competitors, and fellow organizations. 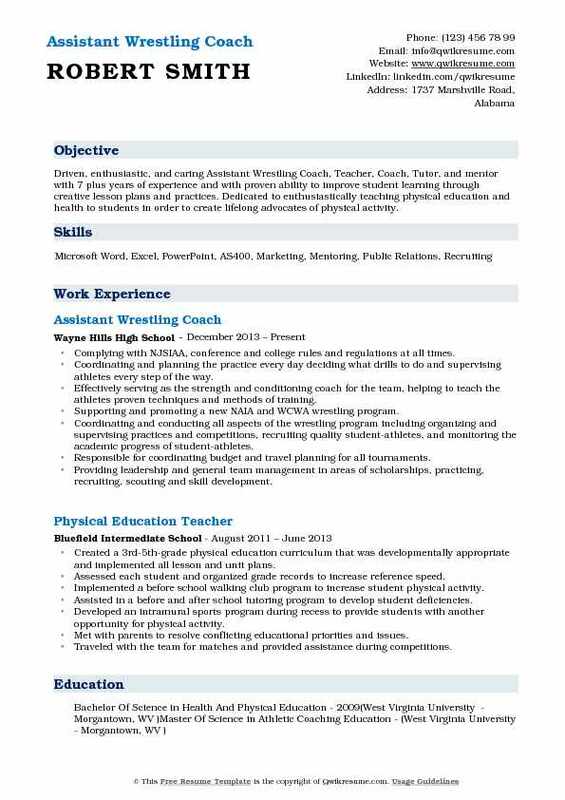 Summary : Driven, enthusiastic, and caring Assistant Wrestling Coach, Teacher, Coach, Tutor, and mentor with 7 plus years of experience and with proven ability to improve student learning through creative lesson plans and practices. Dedicated to enthusiastically teaching physical education and health to students in order to create lifelong advocates of physical activity. Complying with NJSIAA, conference and college rules and regulations at all times. Coordinating and planning the practice every day deciding what drills to do and supervising athletes every step of the way. Effectively serving as the strength and conditioning coach for the team, helping to teach the athletes proven techniques and methods of training. Supporting and promoting a new NAIA and WCWA wrestling program. Coordinating and conducting all aspects of the wrestling program including organizing and supervising practices and competitions, recruiting quality student-athletes, and monitoring the academic progress of student-athletes. Responsible for coordinating budget and travel planning for all tournaments. Providing leadership and general team management in areas of scholarships, practicing, recruiting, scouting and skill development. 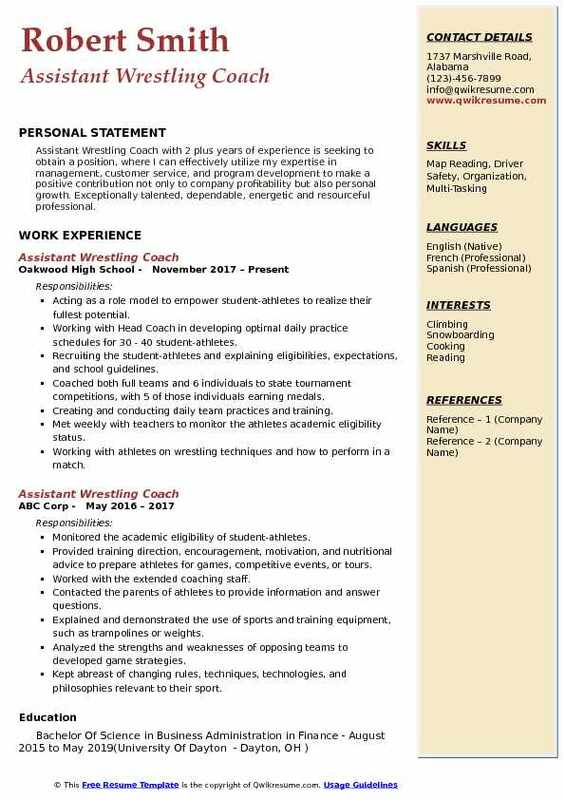 Summary : Assistant Wrestling Coach with 9 plus years of experience is looking for long-term employment to grow with a company. Assisting with recruiting high school-aged prospects from across the country. Implementing the new recruiting process and database to increase efficiency in recruiting. In charge of all staff compliance software. Monitoring the individualized academic and athletic development of student-athletes. Assisting in planning day to day practice schedule along with season schedule. Leading the practices by teaching techniques and drills, demonstrating moves, lifting weights and practicing live wrestling matches. Mentoring wrestlers by sharing experiences and offering encouragement. Offering transportation to and from practices and matches. Helping to improve skills, developing self-confidence, and discipline through positive guidance. 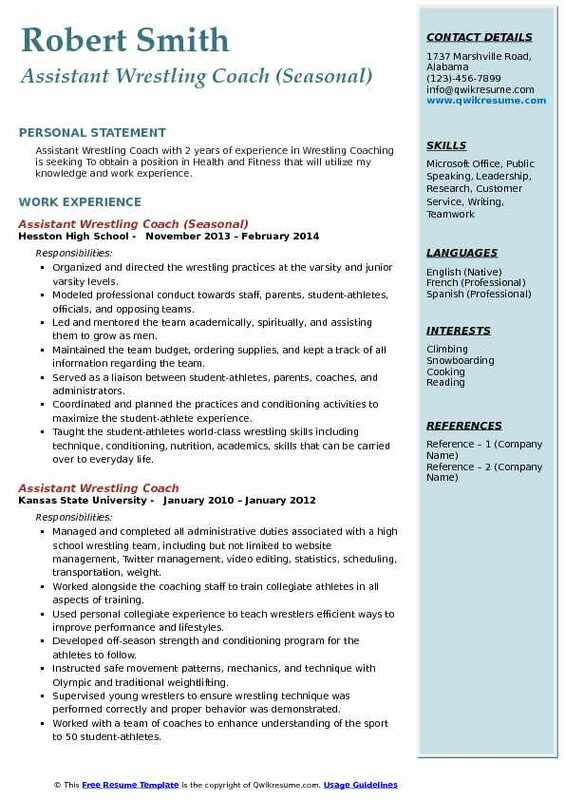 Summary : Assistant Wrestling Coach with 7 plus years of experience is seeking a career where I can apply the technical skills, ethics, and experience obtained as a collegiate level coach and educator; along with the interpersonal and leadership skills acquired by participating in extracurricular activities. Skills : Leadership, Relationship Building, Microsoft Office, Motivation, Support, Communication, Multi-tasking, Detail Oriented, Customer Service, Reliable, Managing Organization, Prioritization, Flexible, Hard Worker. Responsible for coaching the wrestlers, all team documents including team and individual. Connecting with student-athletes to resolve a variety of personal issues occurring in a range of atmospheres. Helping raise participation in total high school wrestlers and doubled the number of state qualifying participants. Assessing and monitoring the student's skills and informing the head coach of abilities and performance. Organizing and directing the small group or individual exercises and/or practices as directed by the Head Coach. Assisting the head coach in teaching rules, regulations, equipment, and techniques of the sport. Responsible for the safety and well-being of student-athletes during the course of a season. Promoting the wrestling program to the public through clinics, exhibitions, and camps. Monitoring the student-athlete academic standings and athletic schedules and setting up study plans. 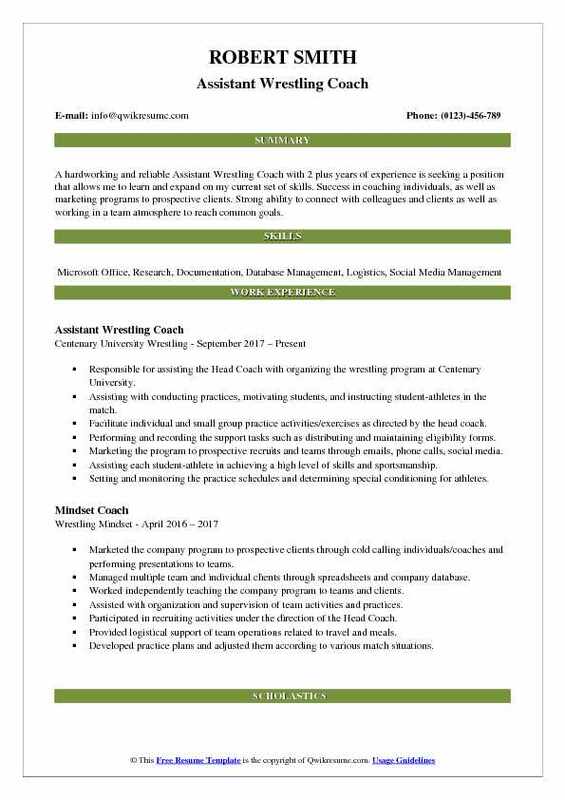 Objective : Assistant Wrestling Coach with 2 plus years of experience is seeking to obtain a position, where I can effectively utilize my expertise in management, customer service, and program development to make a positive contribution not only to company profitability but also personal growth. Exceptionally talented, dependable, energetic and resourceful professional. Acting as a role model to empower student-athletes to realize their fullest potential. Working with Head Coach in developing optimal daily practice schedules for 30 - 40 student-athletes. Recruiting the student-athletes and explaining eligibilities, expectations, and school guidelines. Coached both full teams and 6 individuals to state tournament competitions, with 5 of those individuals earning medals. Creating and conducting daily team practices and training. Met weekly with teachers to monitor the athletes academic eligibility status. Working with athletes on wrestling techniques and how to perform in a match. Making sure each athlete is accountable to the team and instill a code on how to conduct themselves at all times. Implementing a positive coaching atmosphere to ensure the success of each athlete. Involved in a leadership/management role of 35 plus high school teens in the team-oriented setting. Headline : Assistant Wrestling Coach with 6 years of experience is seeking To obtain a position that provides a potential for advancement while allowing room for personal and professional growth. Managed to produce a regional qualifier/stately ranked athlete during the first year on the job. Assisted in all aspects of coaching wrestling through knowledge of the sport, coaching strategies, teaching skills, techniques and athletic development. Designed and administered pre-season and in-season weight training programs. Assisted the head coach in all areas of program management, including, but not limited to, player development, practice. Assisted in managing all program recruiting efforts including identifying prospects, creating and implementing communication. Worked hands-on with athletes daily, on the development of skills and tactics across all weight classes, but primarily focused on the upper weights. Coordinated all team travel arrangements for tournaments and away meets, including lodging, meal location, and car rentals. Communicated with the Director of facilities and operations regularly to schedule room reservations, team competitions, and practice room facility issues.